Well I didnt get the promotion. I have been running that job for 5 weeks now and what a slap in the face. It is still a mans world. It was a hard decision for them it came down to me and one other guy so guess who they picked.... a man. So now I know what I have to do because no amount of blood, sweat or tears and much prayer helped me here, so now maybe God is trying to tell me its time to start that label.. what a hard lesson to learn hard work is not always rewarded when or where you want it to be..
Its been a while but thanks to all of you who didnt delete me, I can now start catching up. I'm now working full time on Post and I actually just had my final interview for a promotion. I will be posting soon, thanks for still being here. 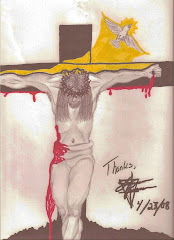 He Died For You.., Live For Him!